I’m sure I’m not the first person to admit that I’ve had a bit of an obsession with over the knee boots (OTK) for a while now. It feels like every time the weather turns colder, they are everywhere. I’ve wanted a pair for ages but a few things have stopped me. Firstly, I’m 5 foot 2, how the hell was I going to find a pair that didn’t make me look like a kid playing dress up? Then there was the issue of price. I’m blaming my mom for this one as I appear to have expensive taste. Every pair I fell in love with was on the higher end of the spectrum price wise. While there’s nothing wrong with that, and you’re normally guaranteed higher quality with the higher price, I really didn’t feel that I could justify spending too much until I knew I’d get the wear out of them. And then finally, there’s the issue of what to wear with the boots. As much as I love the movie Pretty Woman, I have no desire to look like Julia Roberts on the poster. Getting the balance is tricky! In the end, I decided to give them a test run. That is, buy a cheap pair to see if I got the wear out of them before splurging on a new pair. I sometimes do this, it’s a good trick if you’re not sure if something suits you but you want to try it out before spending a fortune. Go to Penney’s (or Primark for anyone reading outside of Ireland), and buy yourself that item for a reasonable price. It lets you see if you’ll actually get the wear out of the item, without making your bank account look very sad. I hate spending money on something and then never wearing it. It’s such a waste. This is the best way I’ve found to side step that issue. 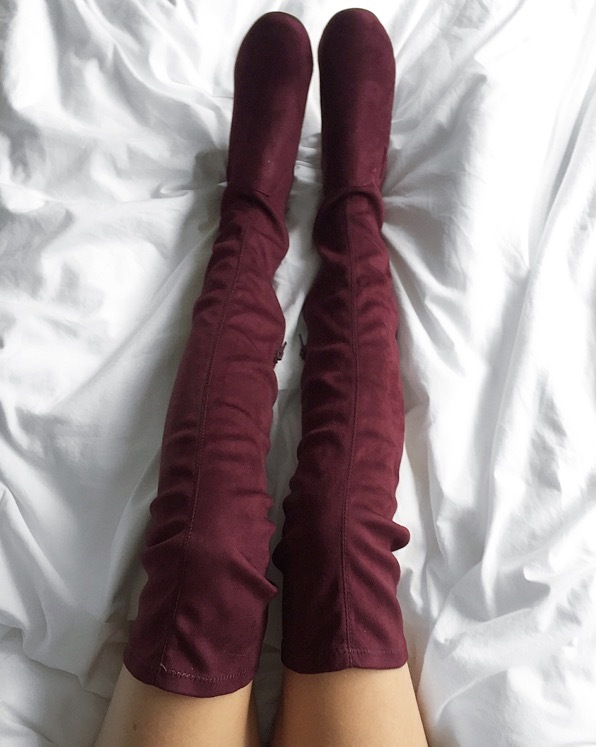 Because I am the worlds most indecisive person, I got the boots in black and this lovely berry colour. At €28 each I thought, why not?! The issue of what to wear them with was solved pretty quickly when I fell in love with this sweater from Topshop. A simple leather mini underneath the sweater, a few gold necklaces, and I was set! I’m no longer afraid of OTK boots, which means I now have my eyes set on plenty of different pairs! Click the images to shop! Stuart Weitzman seems to be winning the OTK boots battle and from what I’ve read here and elsewhere, there’s a reason why people are happy to shell out for them – they’re stylish and really comfortable, but the winner is that (apparently) they don’t lose their shape after a few wears and scrunch at the ankle (like so many others do!). I think I’ll be doing the same as you though and trying out a cheaper pair before going anywhere near the SW’s!